Village of Screamfield was one of our most improved haunts of 2013 - it went from a haunt we avoided to one that we really enjoyed quite a bit, so we were hoping that 2014 would continue that trend. We're very happy to say that it was even better this year! The theme of Village of Screamfield is that there is an entire underground city underneath the current Plainfield police station and that visitors make their way through the underground area. Before entering, visitors are met by a mime who takes them to Mayor Scream, who welcomes them all into his village. This year kept many of the interesting scenes from last year, including the cannibal shack and the area with people dressed as barn animals, while adding and updating some other areas, including a new 3D section which was quite well done. Some of the standout scenes included a funeral parlor scene where visitors were welcomed by a creepy undertaker then led into another room where there was a doll funeral going on - in this room were various live actors coming out of sections in the walls as well, which made it doubly creepy. In addition to some great scenes, there were some excellent acting performances, starting with the female mime who couldn't keep silent (making her a very bad mime) and Mayor Scream, who is a uniquely creepy character in and of himself. Additionally, the creepy actors who played the living animals in the barn scene were excellent, as was a female actress who was crawling backwards towards us as we entered. Other standout actors included the two characters who offered us pretzels and cotton candy, respectively, trying to sell us on the benefits of each type of food and the girl who told me I was standing "in the spot" and when I asked "what spot?" told me the spot that when people stand on it she has to kill them - she was very understated in her performance, and made a scene that could have been overplayed into a very clever and entertaining one. Finally there was the little actor in the final clown area who was holding a large hammer. I said to him "that's a big hammer" and he said "just wait - they get bigger" and indeed they did as the final actor held a giant hammer big enough to crush an adult with. Special mention must also be made of the cameo from Mike Myers - last year's haunt had him peeking around a door and this year's gave him an expanded role holding a chain of dangling body parts. What was he doing here? Who knows, but it was funny! Overall, we really enjoyed the Village of Screamfield - it has gone from our most improved haunt in 2013 to one of our favorite haunts of the 2014 season. 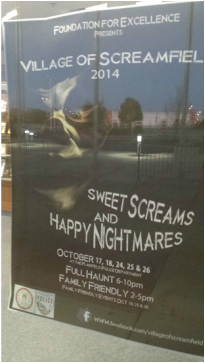 In fact, it's a Hall of Fame haunt for the year - Congratulations!